Nintendo has revealed its online service for the Switch. It's a modest $20 a year, but it's also delayed to 2018. Every since the Nintendo Switch launched in March, we've been waiting to hear what Nintendo's online service was going to look like. Now we know more details, but Nintendo has also delayed the service until 2018. 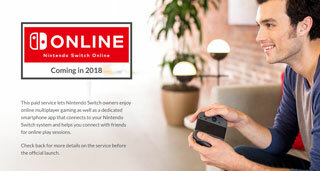 The Switch's online service will run you $20 a year, but you can also opt for a one-month subscription for $4 or a three-month subscription for $8. As previously announced, the voice chat and online lobbies for the Switch won't be on the device itself. Instead, those will be built into a dedicated phone app. That app won't be fully available until the service launches next year, but Nintendo plans to release a "free, limited version" of the app this summer. Also included in the service for subscribers is a selection of free versions of classic games with "added online play," and users will be able to as many of the game as they want, as long as they have an active subscription. Nintendo has so far confirmed that Super Mario Bros. 3, Balloon Fight and Dr. Mario will be available on the service. Nintendo confirmed to Kotaku that "Nintendo Switch Online subscribers will be able to play a wide variety of classic games, including Super Mario Bros. 3, Balloon Fight and Dr. Mario. More games will be announced at a later date. At launch the classic game library will include NES games. Super NES games continue to be under consideration, but we have nothing further to announce at this time." There's still no word on when or if Nintendo might bring a Virtual Console to the Switch, and when asked, it replied, "We have nothing to announce on this topic."